Ramadan is just few hours away. It has already started in some parts of the world. How quickly time flies! Seems like only yesterday we were blogging and sharing our Ramadan experiences from last year. Doesn't it? I made a set of journal and photo prompts for this year too. I've added new ones and kept some of the old ones. I don't know where this Ramadan is going to take me. But I'am more than excited. Our house is filled with a certain buzz. 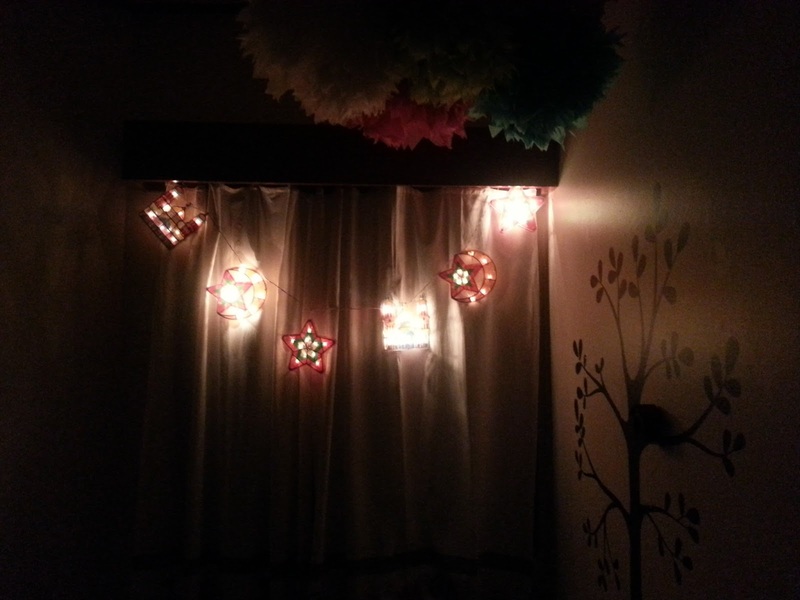 Putting up the lights we bought from Hilalful helped a lot. We have also been reading books of Tarek and Jana. My children love this series and I will talk about them more later during the series. This year also I'am using a mini album to document Ramadan. I finished with the cover couple of nights back and I can't wait to add pages. I also designed these set of Ramadan Digital Printables (sketched by me and graphic design by Becca) which is available at PPS for purchase. You can download them on your pc and print it for scrapbooking, project life, making tags, gift wrapping etc. What I love about digital printables is that you can print them over and over and use them forever. You can check out PPS blog to see how Donna used them. I'am hoping to see more of you playing along this year. Last year I made a lot of friends through Blog and Instagram. I also happened to meet a blogger in person who actually turned out to be someone very close to us. I can't stop smiling whenever I think about it. The concept of Ramadan is the same everywhere. But what makes it different is how we see and experience it. How we change our lives for Ramadan. How everyone else changes their lives for us (which I'am really grateful for). Culture and traditions play a big part in these differences and I love seeing them and learning from them. I find it a very thought provoking and enlightening process. 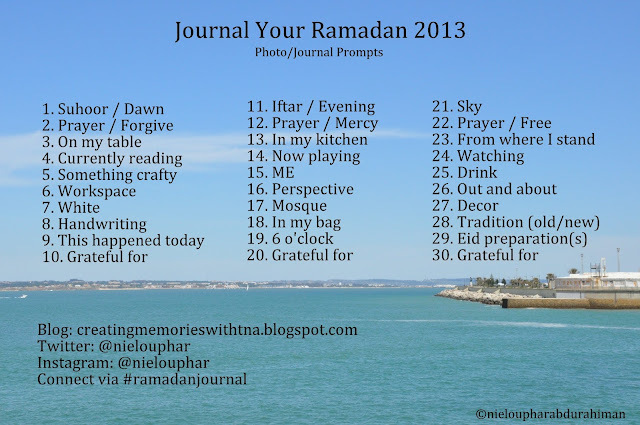 Ramadan Journal is an idea that came to be for the first time in 2012. I loved Ali Edwards' December Daily where she shared her every day activities starting from December 1st until Christmas. It was fun to see different takes of the same thing by others who participated in her series. 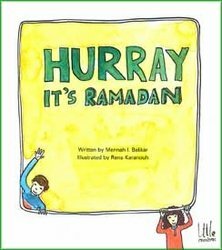 Seeing everyone having so much fun documenting their Christmas, I asked myself, why not do one for Ramadan? Like every other housewife, my days are also filled with day to day activities that some might find very boring. So I decided to have a list of thirty prompts to journal and take photos on. Just like Fat Mum Slim does. These prompts would give me an organized way to tackle thirty days of documenting. You can view all the posts from last year here. Please note that this thirty days' series is not for preaching about Islam. There are many other sources online that would help you with that. This is just a tiny peek into my family's life and of those participating. My blog posts would be of food, crafts, mundane every day activities, things my children said etc. Or sometimes, just a photo. If you would love to participate, you can take a photo and share it on Twitter and/or Instagram with #ramadanjournal. This way all of us can see your photos. I will also have link tool under all my blog posts so that you can link yours'. This series is open to everyone - Muslims and non-Muslims. I'am really excited. Hope you are too. See you soon Insha Allah. Thank you for being so supportive Fabi! Yes, I remember very well. We have been blogger friends for a year now. Vow! I'm looking forward to joining in!!! I took part in your challenge last year and really enjoyed it, so was looking our for it again this year. My sister really loved the idea so she is participating too. Assalamualeikum wa rahmatulahi wa barakatuhu dear sis!